Visit the dark and mysterious world of the undead on this popular New Orleans vampire tour. Walk with your theatrical guide through the French Quarter and hear haunting legends of New Orleans’ famous vampires – ‘real’ and fictional. 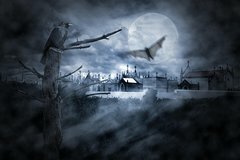 Visit sites associated with these creatures of the night, where you’ll hear chilling tales and learn of scandalous acts. Stop at a notable vampire tavern as well as movie locations from ‘Interview With a Vampire’ and other blood-sucking stories. Be sure to bring garlic along – just in case! Are there vampires prowling the night in the French Quarter of New Orleans? Follow your offbeat, theatrical guide into the dark realm of the city’s undead and find out! Escape into the streets on your 2-hour vampire tour, departing at 8:30pm from Saint Louis Cathedral. Your New Orleans tour guide will provide an eerie, chilling yet fun-filled adventure as you walk to famous sites and hear about true-to-life vampire-style crimes. Visit the mysterious world associated with creatures of the night, including a trip to a noted vampire tavern. You’ll see onsite movie locations for Interview with a Vampire and other sites of fictional creations. As you round dark corners, keep an eye out for bloodthirsty vampires creeping through the antebellum streets of the French Quarter by dusk. Learn about vampire scandals and stories pulled from city police reports, archives, diaries, and newspaper interviews… only you can decide if these vampires are real or imagined!